At first I didn't want to read the latest issue of American Scientist - Brian Hayes, the regular author of the "Computing Science" column is currently on sabbatical, and his articles are my usual motivation for reading AS. It turns out that Dana Mackenzie has provided a really nice article in Brian's absence. Writing about Apollonian Gaskets, as usual for this column (which is about computing, but not necessarily computers), Dana Mackenzie's article combines elements of recreational mathematics, physics, and, of course, computing science. One of the particular Apolonian-ish gaskets that the article mentioned (one involving a circle with zero curvature - a straight line) is even more fundamental to Number Theory than the article indicated - the circles that are tangent to the line in the diagram below are the sequence of Ford Circles that can be thought of as representations of the Farey Sequence. I haven't yet had the chance to really find out, but I am thinking that some of the the general Appolonian circle formulas that Mackenzie discusses in his article can be shown to be consequences of the mediant formula in this "Ford Circle" case. I tried to recreate the Ford Circle component of the nice diagram above in Processing, but my limited skills in this area lead to the numbers (that represent the curvature of the circles) being somewhat off center and not so well-sized. 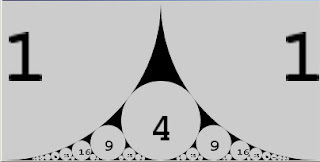 I prefer the version below that does not display the numbers - if the applet loads properly, clicking on the applet-area will cause a new generation of the Farey sequence / Ford circles to be drawn (plus and minus keys give a primitive zoom). As Mackenzie mentions, "the whole gasket is like a kaleidoscopic image of the first four circles, reflected again and again through an infinite collection of curved mirrors." Which might convince you to do some experiments with kaleidoscopes - if so, you might want to check out this recent post at Maxwell's Demon. 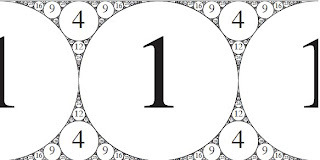 Some earlier blog posts on Farey sequences and Ford circles are here and here. Update: Please check out the great post The Circles of Descartes on the Wolfram blog.